With a rating of 2 trisqueles each. Privileged situation of this house made of stone and wood. 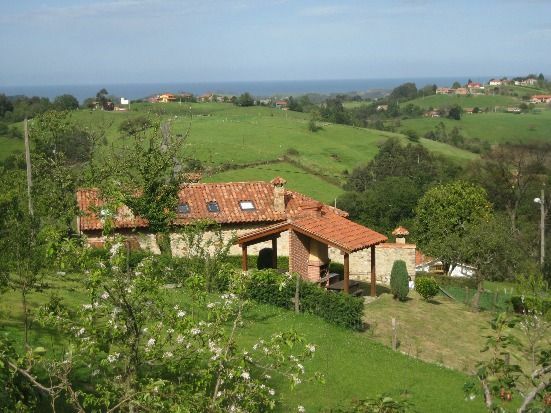 Located in the east of Asturias 7 km from Ribadesella in the rural center of Noceu, where you can enjoy absolute tranquility, from it you can see beautiful views of the coastal mountains and the Cantabrian Sea. Nearby are places of great tourist interest: Tito caves, Romanesque church of the XIII century, Picos de Europa, beaches, etc. The House has 2 floors. The 1st with living room-kitchen-dining room, fully equipped with microwave, ceramic hob, washing machine, iron, TV, etc. Both floors are equipped with heating. In addition to a full bathroom, the house has a toilet on the first floor. It is surrounded by an orchard with fruit trees in which a barbecue has been built that has water and light to make the stay more pleasant to its visitors. From it you can appreciate beautiful views. It consists of two accommodations of 5 spaces each. On the first floor: bedroom with double bed. On the second floor: 2 attic bedrooms, one with 2 beds of 90 cm and the other with a double bed.